November is Osteoporosis Month, held by Osteoporosis Canada to raise awareness of a disease that affects two million Canadians. At CHÉOS, Drs. Sabrina Gill and Shirin Kalyan have contributed to a number of studies related to osteoporosis and the drugs used to treat this common disease. The two Scientists are involved in a 2018 PHC Research Challenge project led by Dr. Victoria Su, Clinical Pharmacy Specialist at St. Paul’s Hospital Adult Cystic Fibrosis (CF) Clinic. Dr. Gill is the team mentor and Dr. Kalyan and Dr. Brad Quon, Research Director at the Adult CF Clinic, are co-investigators. The team will investigate the impact of nitrogen-biphosphonate (N-BP) in CF patients. Nitrogen-biphosphonates are a type of drug that prevent bone loss by inhibiting an enzyme which leads to the reduction in the activity of osteoclasts, cells that absorb and degrade bone tissue. These drugs are commonly prescribed in people with osteoporosis and often in people living with CF, who are at risk for bone loss at an earlier age than the general population. Specifically, the team will look at how these drugs affect vitamin E status in these patients. The need to study the effect of N-BP on vitamin E was borne out of previous work by Dr. Kalyan, among other research. Cystic fibrosis is a genetic disease which primarily affects the respiratory and digestive systems. Among other health issues, people living with cystic fibrosis are often at risk for deficiency in fat-soluble vitamins (A, D, E, and K) due to the effect of the disease on pancreatic function. The group will conduct a retrospective chart review of 30 CF patients who have initiated N-BP therapy and a matched group of CF patients who have never been on N-BP. The primary outcomes of interest are type and duration of N-BP therapy, vitamin E levels after starting N-BP therapy, and nutritional and vitamin supplement use. Statisticians from CHÉOS consulted during the study design stage and will assist with data analysis once collected. The findings of this study will be shared with local endocrinologists and CF Clinic staff as well as at CF conferences. The results may lead to a larger, prospective study in the future and will contribute to improved monitoring of CF patients starting N-BP treatment. 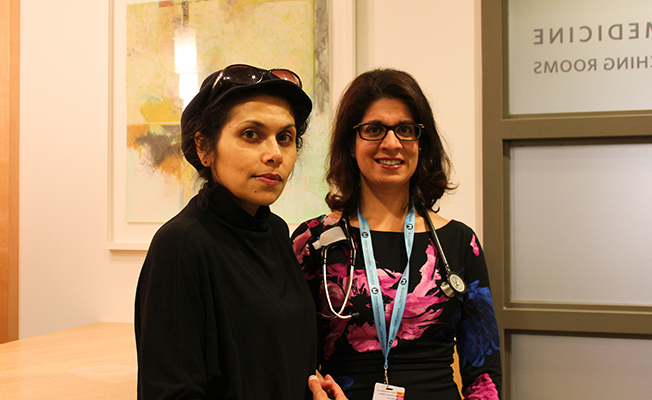 Last year, Dr. Kalyan and Gill collaborated to open a new clinic at St. Paul’s Hospital, the Metabolic Bone Clinic. The Clinic currently consists of two endocrinologists (Drs. Sabrina Gill and Monika Pawlowska) and one geriatrician (Dr. Leo Lai). “Currently, the metabolic bone clinic is providing support to post-fracture patients as well as other groups, such as CF and post-transplant, who are at risk of bone loss and fractures” said Dr. Gill. The grand vision of the Clinic is to maintain a database for people being treated at St. Paul’s for bone loss, allowing researchers to answer pressing questions relevant to a wide-range of diseases, participate in disease-specific clinical trials, and individualize treatment for patients. Drs. Kalyan and Gill have also been focusing on increasing the capacity of the clinic to contribute to research. Once the trabecular bone scores are implemented, it will allow the Clinic to pursue more research into its use in unique populations. Ultimately, the two Scientists aim to change the way clinicians approach bone loss and related diseases. “Collecting different types of data in individuals dealing with complex bone loss problems will allow us to contribute to clinical discourse in the management for these diseases and better inform their treatment decisions” added Dr. Kalyan. Dr. Kalyan is the lead author on two recent publications for studies that were assessing novel biomarkers for bone fragility in specific populations: women with HIV and women experiencing chronic low grade inflammation.